Football, basketball, fall parties and celebrations are right around the corner. I don’t know how time passes so fast but the kids and I realized yesterday that more than one third of the summer break had already passed. Can you believe how fast the seasons move? Are you a big game day family? Do you watch football on Sunday and line up the snacks or do you prefer movies? 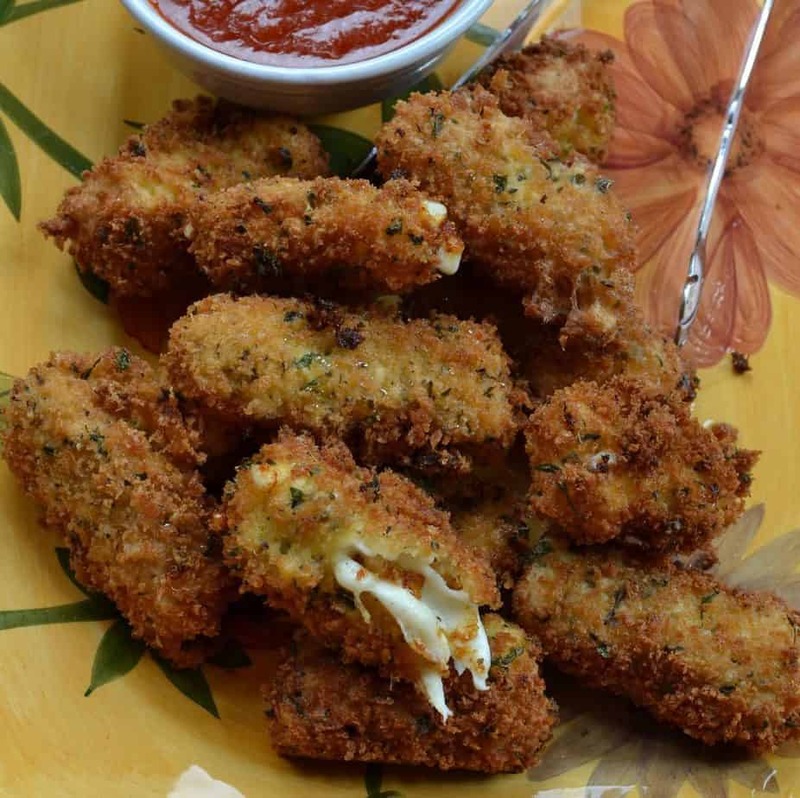 These Panko Breaded Mozzarella Sticks are perfect for either. 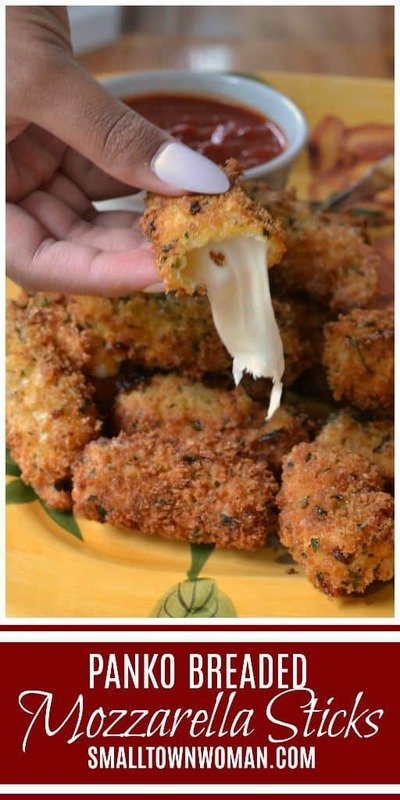 There is just something heavenly about a crispy breaded piece of melted cheese! I love cheese! Who doesn’t love cheese. I think that everything should come with a side of cheese! Panko Breaded Mozzarella Sticks are so easy to make and you can even flash freeze them uncooked for unexpected guests. This recipe takes full advantage of mozzarella string cheese because it is already cut into sticks. 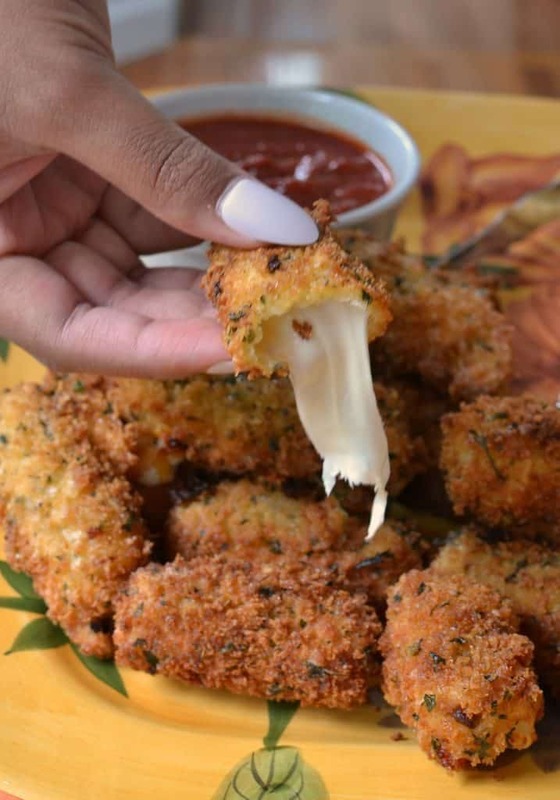 How to make Panko Breaded Mozzarella Sticks. Combine panko bread crumbs, parsley, oregano, basil and garlic powder. 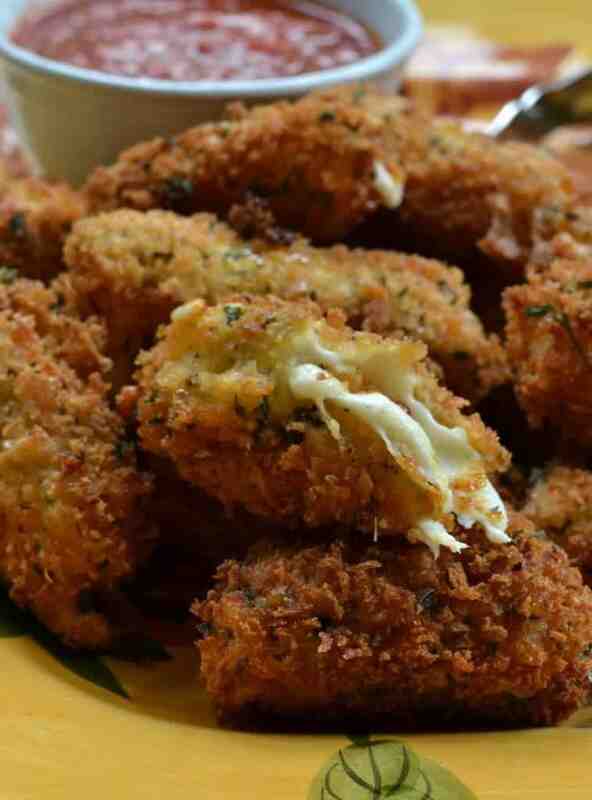 Dip mozzarella sticks in flour, then in eggs and then in the panko breadcrumb mixture. For added crispiness dip back in the eggs and into the panko breadcrumb mixture. Place in freezer for 20-30 minutes as it helps the breading stay on during the frying process. Fry them in vegetable oil until crispy brown. Drain on paper towels and serve with marinara. Helpful hints for making Mozzarella Sticks. Roll all the mozzarella sticks in flour first and get that step out of the way. Avoid the dreaded breading fingers by using one hand to dunk in egg mixture and use the other hand for the breadcrumbs. Of course that is easier said than done because we tend to always work with our dominant hand first. Use a deep fryer or high temperature thermometer to keep your oil as close to 375 degrees as you can. More appetizer recipes you will love! This post was originally published July 17, 2014 and was republished June 25, 2018 with new pictures, relevant information and helpful hints. Panko Breaded Mozzarella Sticks are deep fried crispy breaded pieces of mozzarella. They taste so much better than the frozen box kind. Mix eggs with milk in shallow bowl. Mix panko breadcrumbs with basil, parsley, oregano and garlic in shallow bowl or plate. Place flour in shallow bowl or plate. 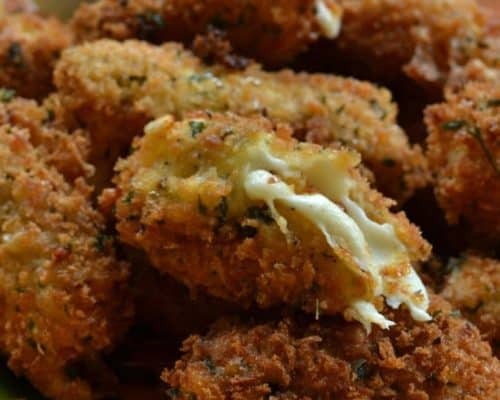 Dip each mozzarella stick in flour and then in the egg mixture, into the panko breadcrumb mixture and back into the egg and into the breadcrumbs one more time. Place on cookie sheet sprayed with nonstick cooking spray. Place in freezer uncovered for 20-30 minutes. Heat oil in deep fryer or dutch oven to 375 degrees. Cook the sticks a few at a time just until golden brown. It only takes 20-30 seconds. Drain on paper towels. Serve with marinara or chipotle mayo. Use a high temperature thermometer to try to hold the oil as close to 375 degrees as possible. These can also be baked . Drizzle with butter or spray with nonstick baking spray. Bake at 400 degrees for 6-7 minutes. what temperature and duration should i use if cooking in a deep fryer instead ? Cook at 365 degrees until lightly browned..30 seconds to one minute. As soon as they start to float watch them really carefully….there’s about 3 seconds between done and leaking cheese all over the place. I made them today and they only took about 20 seconds. Is this a shallow fry or deep fry? You could do either but on a shallow fry you would need about 1/2 -3/4 inch of oil and would need to roll them to make sure they get brown.